A dish that was fashionable in the 90's. 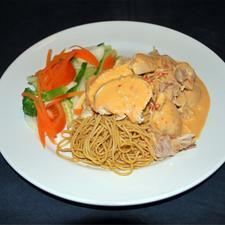 Good for a party served on a buffet of hot dishes with noodles or fragrant Thai rice. Cook these ingredients slowly and let the sauce become syrupy and sticky. Make it up the day before or earlier and keep in the fridge. The clouds will go away and a sunny day will come so that you can then concentrate on lighting the barbecue coals and pouring that chilled beer. Basil oil flavoured with garlic ahhh......the flavours of summer. Back in the 80's this dish was king. Every respected restaurant had it on the menu. With those newly discovered soft green peppercorns. Perfect for a cold day why not make it the day before so that it's ready to eat when you come home. This is a really fragrant dish with very wonderful texture. 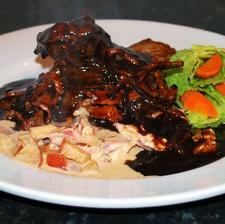 Unlike a traditional western stew this dish has many flavours that many have come to enjoy. 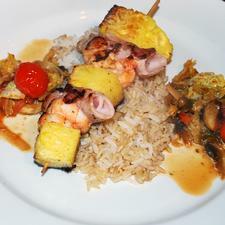 A great dish for the end of summer on a wet Autumn evening. This is great for cooked ham or turkey if like me you have a natural loathing of cranberry relish. 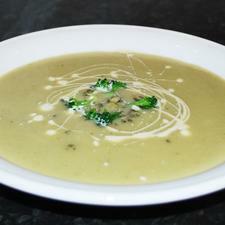 This is a great soup for lunch on a cold winters day. Don't burn the onions but add a little extra sugar if you do. 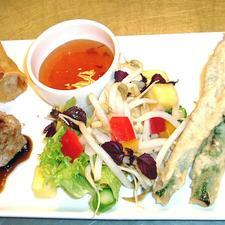 Something different on a finger buffet or you could make these as part of an Asian fusion dish. The bouquet garni is a natural flavouring of herbs for stocks and stews. Now you can use other herbs in different sauce bases but be careful and don't use too much of a pungent herb that will overpower the flavour of a sauce. You might like to use dill in fish sauce, basil, rosemary and coriander. Braised Fennel Filled with Vegan Cheese, Wheat & Tomato presented on a Bed of Wilted Spinach & Almonds This is vegan main course from a competition I took part in for the Vegan Society and was runner up. 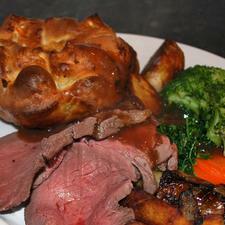 A dish to warm you in Autumn and Winter using topside as it should be used as opposed to roasting. I like venison on Christmas Day so here's a recipe I might be tempted to try. Blackberries are a part of my childhood their flavour will never leave me. More subtle than blackcurrants but a refreshing alternative for me. I made a jam from berries picked from a hedgerow near my home, straining it well to remove the pips and make more of a gel. Enjoy as the autumn nights come drawing in. I served a few more vegetables i.e carrot sticks, cabbage strands. peas and paysanne of leeks with this dish; oh and quartered potatoes cooked in butter. 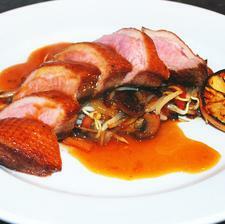 Full flavoursome duck breast with an oriental spin on it perfect for a Saturday night. 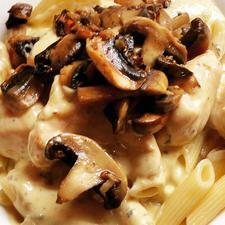 Perfect for a cold winter dinner and done in the pressure cooker saves a lot of time! 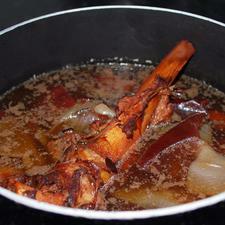 Brown stock is used in rich stews, sauces and glaces. 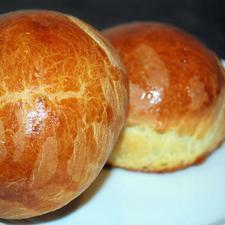 Use my brioche bun recipe or buy some if you don't have time. Use any pasta you like but tri-colour spirals (Fusilli) will look very appetising. If you?re a meat eater then chuck in some pieces of cooked ham or bacon, enjoy!!! Hot and spicy serve with a green salad. You can get one whole piece of beef for this recipe if you like. If you do you will need to cook it for about 25 minutes or less if you want it rare. 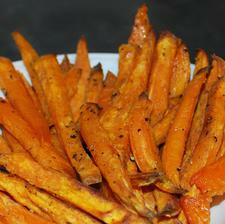 This makes a great snack in front of the telly or a good side dish with a steak and salad. This is an indulgent treat for garlic lovers! Chicken depending on where you purchase it from can offer little or no flavour. 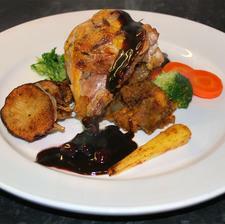 The humble chicken leg darker in colour is more flavoursome than the breast meat and is relatively cheap. Infusing a flavour into the meat is a good thing to do and will help to enrich its flavour. 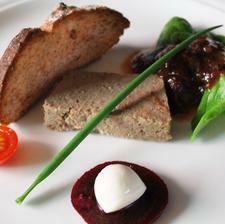 In Britain when we talk of stuffing one usually thinks of sage and onion but a forcemeat made like a mousse from meat is better for this type of dish and will bring a touch of class to it. The mushrooms add an aroma that lifts the chicken leg to a different height and you will be happy to serve them at any dinner party. If you're still not too sure perhaps use corn fed chicken legs. An English favourite! This rich, creamy curry offers an alternative to the traditional curry narrative - blending silky-smooth cream with sweet tomatoes ensures that everyone can enjoy this dish. This is a refreshing canape to have before a summer dinner party or drinks party 'al fresco'. If you can't get fresh tomatoes cheat by using juicy tinned tomatoes. Panna cotta with a twist better than blancmange. I think I'd rather have blancmange over panna cotta. Chopping an onion neatly and efficiently is necessary when producing lots of dishes or large amounts. Even if you are making a small dish or sauce the onion should be neat to give the dish a good appearance and facilitate the even cooking of the onion. 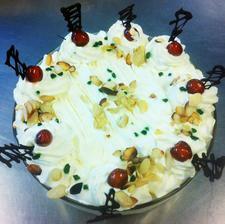 This dish can be made in a 1 pint pudding basin or use ramekins or dariole moulds to make individual ones. Thinking back to the autumn glut of apples you've still got left what about making a Charlotte but incorporate some mincemeat to turn it a little bit seasonal. I've left out the obligatory booze but you might like to splash in some rum or brandy just to top up your central heating from within! So flambé the apples then mix them with the mince meat. This is so easy to make and yo can always put your own twist on it by adding a dash of cointreau or other favourite tipple. 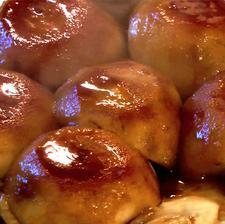 the recipe will make two puddings that will serve 12 - 16 in total. The bonus of course is that you know what's in the pudding. No funny chemicals and you can even put in a couple of wrapped coins as was the custom before health and safety started to create the culture of fear. What better way to serve a Christmas Pudding. Have it a couple of days after Christmas Day and use up the leftovers. Hmmmm all the flavours of Christmas in one massive hit. Coated with Salami & Pimento Sauce on Seed Mustard Seasoning This dish does take some time to prepare and should be started at least a day before you plan to eat it. But take your time, perhaps a few sips of wine after all it does have it's origins in classic French Cuisine. Truly though this a marriage of French and Austro-Hungarian Food. The only thing missing is the Beetroot , my inspiration for this dish lie in the time I spent in kitchens working with chefs from various parts of Europe. One friend Fritz Siedl from Austria would have relished this dish and rounded it off with a cognac and plate of Apple Strudel. 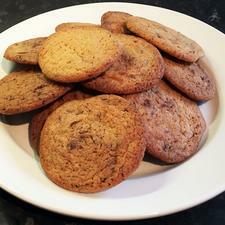 This recipe makes lovely soft cookies that are just delicious! 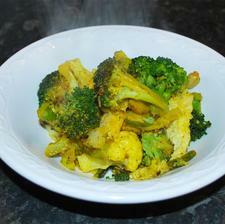 This is a simple and versatile recipe for a tasty serving of vegetables with a curry. Cutting a chicken up for cooking will allow you to cook the chicken more quickly than cooking whole. In the 'Classical Kitchen' there are many recipes that use chicken cut for 'sauté'. This is not the correct method here I will show that later. For now this method will allow you to get used to handling your knife and getting the most out of the bird. When chickens are on offer you can joint them and freeze as individual joints for use throughout the week. Two methods for you to try. I prefer the traditional method myself! 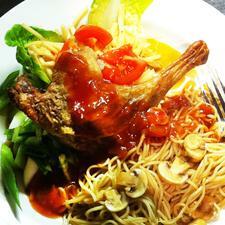 You can often pick up duck legs cheap especially in supermarkets. So here's a recipe for a cheap weekend dinner. A salad is not dressed without a decent dressing and don't be afraid to use loads. Go a bit continental and enjoy. The following recipe is an economy one to start you off. I'll put up some more refined ones later but for now you need to use a heaped dollop of Dijon Mustard and you can use half and half olive oil and corn oil if you like. If you don't have a whisk or blender put all the ingredients in a clean coffee jar or similar put the lid on tightly and give it a really good shake to combine all the ingredients. Chicken legs are fairly cheap and I find they are juicier and carry more flavour. November is often the greyest of months but here is a suggestion to brighten it up a little with a hearty meal of pork in a rich creamy stilton sauce sweetened with apples and celery. This is a good quick recipe that can have the main elements prepared in advance ready for when you trudge home from work. 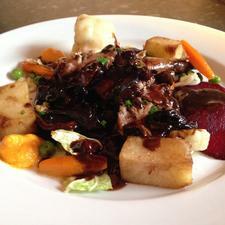 There are lots of good produce around in November with plentiful game and root vegetables. 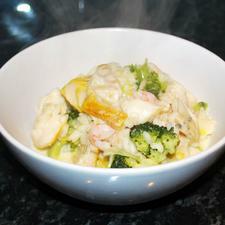 This is a quick way to do something a little bit different with a piece of cod and some prawns. 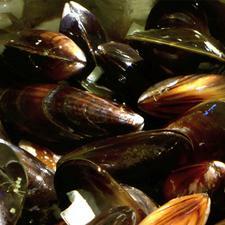 You can make a proper shellfish sauce by following the recipe that appears also on this site. This recipe keeps the pork moist and if you can believe the British Pig Executive there is no tape worm from eating undercooked British Pork so cook it underdone. For a real treat use Chanterelle Mushrooms. A bit of luxury! 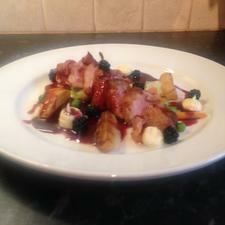 Pork fillet is easy to prepare and you can infuse it with lot's of different flavours. Here's one that can be done in advance then reheated from stage 4. Use plenty of Dijon! This can make a really good starter or main course. 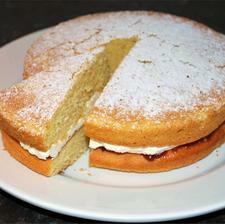 A nice rich fruit cake, this is a really easy recipe to make. There is no technique like 'creaming' or rubbing in' and no chance of the mixture curdling. This will make a good snack when you have to crouch over papers and books revising and you can't clear all those papers away. A great dish on it's own as a sorbet course on a Summers day or with avocado as a starter or prawns or smoked salmon and a herb salad. The number of gingerbread men will depend on the size of your cutter. Make up a bit of icing to decorate. 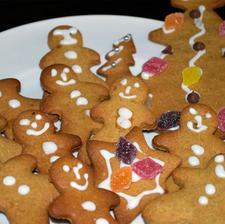 Get a Christmas Tree cutter and make some Gingerbread Christmas Trees. You can decorate with liquorice allsorts that look like presents on the tree. Tip: When rolling out the gingerbread use a piece of thick plastic or cling film on the work surface. This is great for a starter for your dinner party in Autumn. I really like a nice slice of granary bread with butter on and why not have it with some smoked salmon. This dish makes a great low-carb breakfast. Mackerel cheap and plentiful at this time of year. 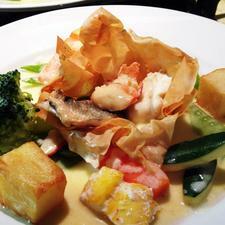 You can use any white fish for this dish pangasius (river cobbler)or you can use white fish fillet, pollack or hoki. This recipe calls for guinea fowl that has been jointed. You can watch the video showing you how to joint a chicken and utilize the same technique. Don't over cook the guinea fowl or it will taste dry and stringy. This a lovely dish for a summers evening. You could perhaps dine al fresco and have chilled glass of blanc de blanc. A classic sauce for fish or as a base for Bearnaise which is great with steaks. Some recipes use lemon juice instead of vinegar which is fine. 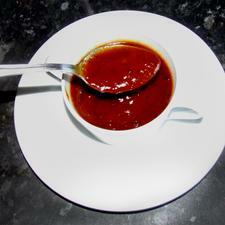 If your sauce gets too thick then you may add a little more vinegar or water or white wine. I prefer wine as it adds to the depth of the flavour. Hats off to the Swiss who wouldn't be without a dash of Worcestershire Sauce added to the sauce and yes I'd go along with that. 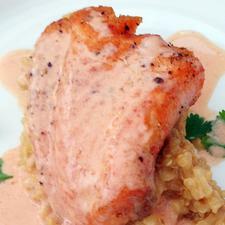 You can vary the sauce with herbs like mint or tarragon or add orange juice or white wine. This is great if you have vegetarians coming over for dinner. You can make as much or as little as you like. Even do it as a starter for everyone. A real treat but these do take a bit of time to make. Well worth the wait. Here is a great winter pudding. If you don't like Drambuie then use Cointreau or any other spirit or even leave it out. This is the real taste of Autumn something to savour before the Christmas rush starts and you have to start making mince pies and pickles. A warming nutty flavour of the artichokes to get the chill out of the bones. You can get the kebabs made the night before and leave in the fridge for the next day. But remember they will look and smell great and others may be tempted to eat them so make extra and invite everyone in the flat. These are kidneys that are not often seen on menus. The flavour is not as strong as other kidneys and the texture is also different. Now many of you will be looking for a neatly layered dish of sliced potatoes. Well this is the way most people in the north west that I've encountered make their hot-pot but there are many variations. Splash out for a bit of lamb now and again. 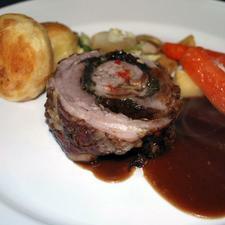 Lamb rumps became popular a few years ago in restaurants and banqueting when rack of lamb became too expensive. It's a welcome treat in a desert of chicken. Found on an Indian restaurant menu the seekh kebab makes a good starter but you can go further and make into a snack or light meal. 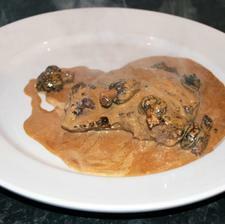 Ask most chefs of their favourite foods and I guarantee a lot of them will come up with some type of offal in a dish. For me it's liver but there are others that feature highly on my list. 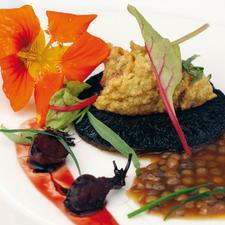 Often with offal there can be flavours and textures that are totally different to ordinary cuts of meat. So here is a recipe for lamb?s liver although it will work with most types of liver but just remember not to be obsessed with the national pastime of overcooking food. 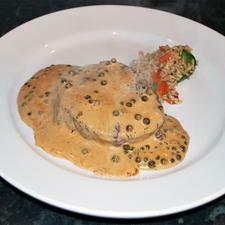 Try to keep the liver pink in the centre and serve straight out of the pan onto the plate. Then eat immediately. You will never braise liver again. Hare is not a commodity you see very often but in a decent local butchers they turn up now and again. This recipe has a real old English feel to it. 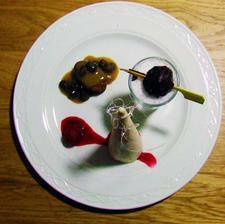 the beetroot and the beer make a wonderfully fruity sauce with the gamey flavours of the hare. Pork is really cheap but try and buy British because I believe it is tastier and cleaner that imported meat. There are barbecue sauce recipes on this site or you could just make a mustard sauce with French mustard. Venison is one of my favourite meats to eat. This is a more expensive cut and if from a roebuck will go extremely well with this tangy sauce. A cartouche is used to cover dishes cooking in the oven or to cover sauces to keep warm and the technique can be used to cut the paper to line the base of a cake tin. Meatballs made like this are wonderful. You can just use beef if you don't like pork or maybe some of your colleagues don't, just double it up. "Nothing would be more tiresome than eating and drinking if God had not made them a pleasure as well as a necessity." ~Voltaire. 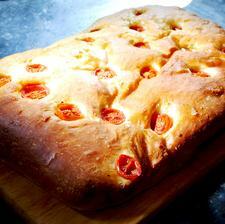 This is an easy recipe to do that can cook away in the oven whilst you finish that bit of reading! 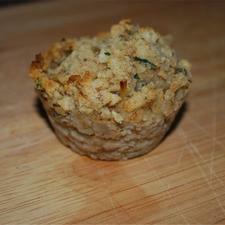 Why not make some novalty mince pies or make tiny ones for petits fours to have with coffee after dinner. Every time I eat mussels I am transported back to Brittany where I have spent many happy Summer holidays in recent years. 'Moules et Frites' in Carnac in a restaurant overlooking the bay at La Baie...hmm.. heaven! Lamb neck fillet can be reasonably priced but you will usually see it in recipes that need a long slow braise in the oven. This leaves the texture of the meat more like stewed lamb. 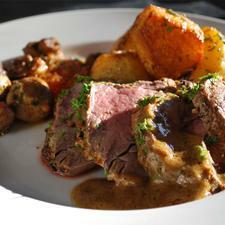 Cooking sous-vide takes longer but offers up really tender, juicy, medium lamb. When I first started my career in catering as an apprentice in Worcester this was one of the desserts I often had to make, and in truth, the long since vanished sweet trolley of the grand hotel restaurants always had a trifle on. So get some nostalgia and make a trifle better than your mum made...not a bit of jelly in sight and plenty of sherry to get up the noses of the puritans! Take your time with this one then settle down in front of a good film with a beer. 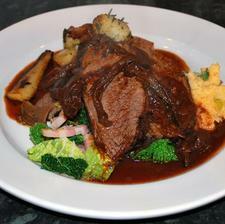 Ox Cheek or Beef Cheek is a really tasty piece of meat. Recently revived by some supermarkets they are readily available. 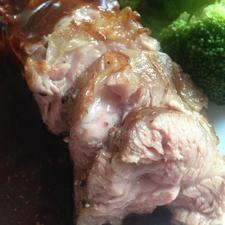 Here's a recipe I've used cooking this very tough meat in a pressure cooker. Cooking it this way seals in the flavour and tenderizes it quickly. A classic starter suitable for any time of year, make up for a snack or a buffet. 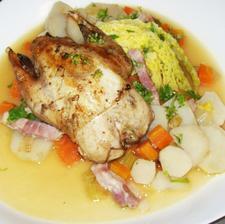 If you can?t find partridge for this recipe then use any game bird or even chicken. Game is best though as it's low in fat ideal to kick start your diet. The difference between dried and fresh pasta is night and day - make it just once and you'll never want to go back to dried again! This is a dish warming and rich with it's roots in the last century commonly called Beef Olives but I don't see or taste olives. 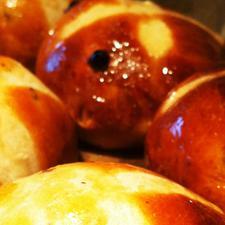 Came across this recipe many years ago whilst researching for a medieval menu. 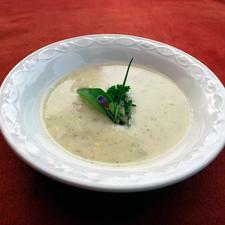 It's a refreshing soup ideal for late Spring. 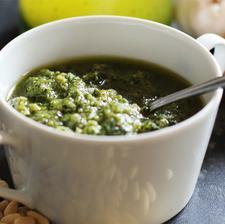 If you're a fan of Italian flavours and cuisine in general pesto really does hit the spot. Making fresh pesto will delight the palette in a way that only the marriage of simple ingredients that burst with flavour can - basil, garlic, and olive oil make for a stunning sauce! This is a really low fat dish with beautiful mushrooms and the berries of late Summer. 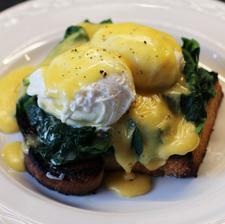 Serve with sautéed potatoes tossed in butter with basil, swede puree and savoy cabbage. Some pasta like spatzelle or fettuccine is equally good with this pheasant dish. For 2 but use the formula and multiply for more. This is a really easy pizza recipe. Children especially love to make pizza. Get them kneading the dough and rolling it out even if initially mixed in the mixer. A quick dinner recipe for anytime of the year. A great dish for an Autumn evening. You can pick which ever alcohol you like to enhance the flavour and you only need a splash. Perfect with a summer BBQ! This is a great way to serve rabbit and it's lovely to use a real old English drink in the sauce and the lavender tops it off. 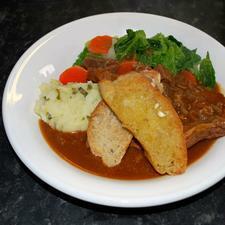 A lovely warming dish to serve with kale, mashed carrot and swede and marquis potatoes. 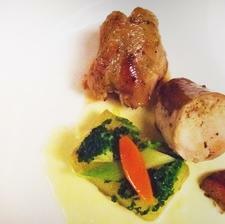 Rabbit is not really seen very often on our menus. The image of Bugs Bunny or the children's pet does not really help. When I was young I remember an Italian family that lived a few streets away they reared beautiful big rabbits, we kept rabbits and I didn't think it unusual that they had similar pets. Except their rabbits seemed to stay forever young and bright looking. Unlike ours that grew old and a bit tired looking. Must have been the selective culling and restocking. They had a detachment from keeping rabbits as pets. Cheap lamb unbelievably. 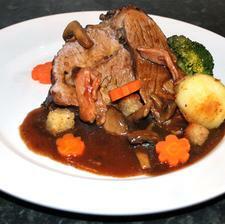 This is a slow roast you can do it in four hours but why not take six hours. This a low temperature roast and it's the best way to get a really tender roast. I love roast pork particularly in the Autumn but anytime throughout the Winter also is a good time for pork. 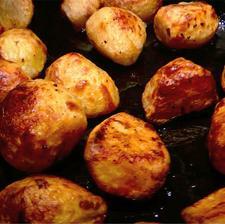 Roast potatoes are not as easily understood as one might think. There are all sorts of abominations going on. This is really easy to do. there is no need to boil them first or to put rice flour on them or to use goose fat. these are all peasant ideas that have no place at the table of 'haute cuisine'. As always the simple root is the best. It's not difficult so don't over complicate the job. Desiree, Maris Piper or King Edward are best for the job. Rösti is a national dish from Switzerland. 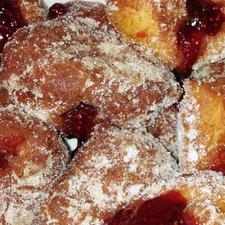 It is used as an accompaniment to a number of main courses including veal, liver and pork. The dish we are making here is Berner Rösti but you can make a Zuricher Rösti using only potato salt & pepper it you wish particularly if you are vegetarian. Here's one for a more exotic use of a humble chicken breast. Packed with flavour and lots of nice colours on the plate. They say there is nothing like a free lunch but if you know someone that goes out shooting perhaps they will bring you back some of there prey. A light dish for June particularly when its warm but rainy outside. There's a mousse involved in this recipe so to do the job properly chill all your equipment i.e the processor bowl and blade before use. 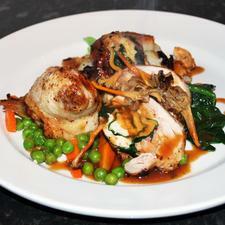 Sage and onion stuffing is perfect with pork, duck and goose. The sage is said to help relieve any discomfort from eating fatty meats. Apart from that, and more important, the flavour is wonderful! I've always got some salad in the bottom of my fridge and this dish is one that I make up when I?m looking for something simple and I just quickly roast the peppers to bring out the flavour of the natural sugars in them and toss them all together before adding the cheese and splashing with some good quality olive oil. A little pasta starter, just serve one per person if having lots of courses. Yes a bit of luxury, even if you are a student. Once in a while you need to do that. This is a simple treat for a Friday after the lectures you've been to this week or a mid week boost of omega 3 for your brain power. 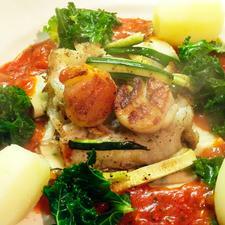 This is for a fish course so only small portions but you could always just do this recipe for two. 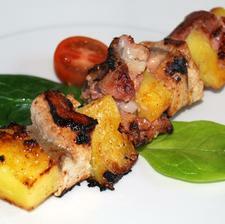 This is a really tasty kebab for a summer barbecue! Not sure its going to work? Trust me it really tastes great. 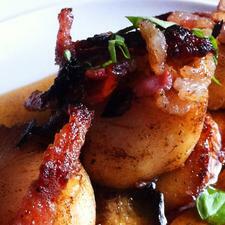 One of those marriages made in heaven bacon, scallops and whisky not forgetting the butter. this time though with the addition of black pudding. It has to be from Bury non of your over spiced pretenders form north of the border! 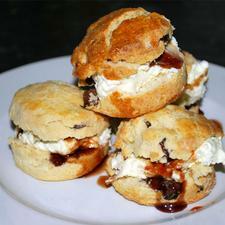 Time for tea, get these baked and serve with whipped cream and strawberry jam. This is great for a snack and makes an alternative to barbecuing or as part of a buffet. Tasty prawn toasts, use them on a finger buffet or as an accompaniment to a Chinese meal. 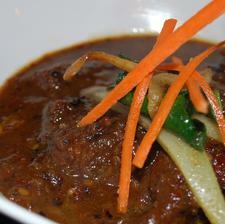 A curry flavoured with white wine, packed with spice and made in the way it is in restaurants. This recipe makes a classic shellfish stock. If you want to be continental add a glug of Pernod at the end. Great for a dinner party at a reasonable price especially in late Winter or early Spring. This is best cooked on a barbecue in the garden using the barbecue as a stove. Because you can end up with a smoky kitchen if not careful. A simple set of ingredients that combine to make a delicious dish. A nice alternative to normal chips! It's wonderful how new flavours can be discovered time and again. Not really having a sweet tooth like our transatlantic friends the sweet potato stayed off my radar until it was married to the spice blend of ras el hanout from north Africa. This is great as an accompaniment to a main course or use as a salad dish for a buffet or gathering. What could be better than a Summer barbecue and this recipe cooked on charcoal. I got this recipe from my brother originally and I've adapted it slightly, break out the lagers!!! Tarte Tatin is simplicity itself but easy to mess up. You have in this dish the lovely buttery caramel combining with the apples, all you need do is serve some crème fraiche or ice cream or just cream with it. Here's a different way to serve up some chicken at a cocktail party or buffet. This is a good base sauce for some recipes or as a dip and you can even use it on pizzas. This preserve goes well with hard cheeses like Cheddar or Red Leicester. For though I'd have it with the left over turkey at Christmas or Thai Fish Cakes. 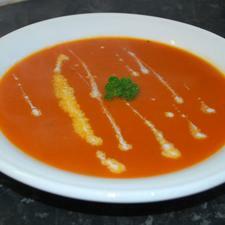 This is a classic soup and often a firm favourite of even the most picky diner! This is so simple to make and you can use it for a snack or cut up and serve when friends come round and serve with soup or starters for a dinner party. Banana Tofu Ice Cream with Butternut & Molasses Pudding on Rum & Raisin Caramel Sauce with Coconut Smoothie Shots This is a dessert that is vegan and I designed it for the first professional Vegan Chef of the Year Competition held by the vegan society. I was runner up. Tuna out of a can smells like cat food to me but hey it's one of the best proteins you can get and low fat. All food is good but some well quite frankly tastes horrible but there is a way to tone down or over power those less appealing notes of a flavour. Here?s a tip don't like a tuna sandwich? well load it with sliced beetroot (lot?s of goodness in one hit) or pickled red cabbage. Back to the recipe though there are a few extra flavours here to help make the tuna taste great. This is surprisingly easy and nutritious. Recommended Brain Food for revision. 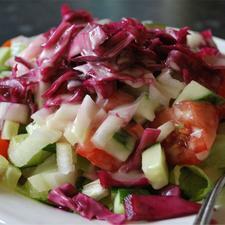 A simple low fat dish from turkey. You could always boil up the marinade and thicken with cornflour add a few chopped tomatoes for a dip or sauce. Vegetable Chilli For a chilli add some chopped fresh chillies or chilli powder, then add some home made tomato sauce. Finish with some kidney beans and serve with rice. Vegetable Lasagne Layer with lasagne sheets and top with cheese sauce to make a Vegetable Lasagne. Vegetable Wraps Fill into tortilla wraps and roll up. Remember you can add in other vegetables to vary it. If adding vegetables like swede, parsnip, turnip, cauliflower and broccoli then blanch first in boiling water. 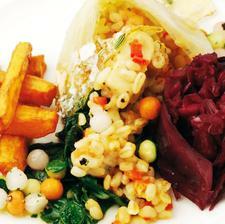 Remember whatever vegetarian dish you are preparing vegetables are not enough to keep your body and mind functioning. Make sure you include beans of which there are many from red kidney beans to flagelot, black beans to black eyed beans or lentils particularly the green ones and chick peas or nuts. "Nothing would be more tiresome than eating and drinking if God had not made them a pleasure as well as a necessity" ~Voltaire. Well here is a staple for vegetarians on campus. You can use any beans or vegetables in this recipe. A truly old English inspiration. All the notes of a Winter dish. Great treat for mum on Mother's Day but remember to clean the kitchen afterwards. For this recipe you will need 2 sandwich tins or flexi-moulds, baking paper, cooling rack, pastry brush, mixer or food processor. Fold: means to mix lightly using a metal spoon, so that as much air as possible remains in the mixture. This helps with the rising of the cake. This is one of the base sauces of any good kitchen, béchamel or White sauce. From this sauce you can make cheese sauce, parsley sauce, mustard sauce and many others. White stock you will be using in sauces like veloutes and fricassees. This is a really easy recipe. Just take your time and go away and do other jobs. You can't rush the dough.